Razor burn: We’ve all seen it, probably most of us have experienced it, and I’m sure we all agree that it’s the pits. There’s nothing like an unsightly rash to ruin what was a perfect shave just a few hours ago. For men, it is particularly annoying and unattractive. Beyond the aesthetic impact, razor burn is uncomfortable, resulting in itching, burning, or pain. In its severe form, commonly referred to as “razor bumps,” it can become chronic or permanently scar. Ultimately, Will got so fed up, he gave up. He decided to grow a beard a few years ago, and it remains today. The red, burning rash, and the frequent tender ingrown hairs, along with the hassle and cost of constant shaving experiments, got to be too much (and I think the beard suits him, especially with the salt and pepper creeping in). It’s a work of art that he enjoys tending. But a beard is not an acceptable or feasible solution for every guy. What, then, are some options? First, let’s cover some basics. While the two terms are often used interchangeably, razor burn is a minor, minimally symptomatic red rash that appears after shaving due to injury to (sheering off of) the epidermis (top layer) skin. Razor bumps, on the other hand, are red bumps that appear after shaving due to injury to hair follicles (openings or pores through which hair shafts poke through the skin’s surface). Razor bumps, also known as ingrown hairs, are a more serious and symptomatic problem than a simple razor burn. They’re caused by strands of hair that either curl into adjacent skin or back into their own follicles. People with sensitive skin or coarse or curly hair are particularly prone. In the medical community, the more severe case of razor bumps is called folliculitis, which means inflammation of the hair follicle. This can be the result of trauma with shaving, infection with bacteria or fungus, or spontaneous improper hair growth. Folliculitis due to shaving typically results from injury to the hair shaft when a freshly shaven hair is cut an an angle and regrows improperly, curling into the skin. The visible bump is actually the ingrown hair, now swollen and red. Folliculitis may occur anywhere on the body, but the beard region is especially susceptible. Razor bumps or folliculitis. most prevalent in darker skin types and those with curly hair. occurs in up to 60% of African American males, according to the AOCD. Shaving too close to the skin typically causes these conditions, and increased shaving pressure and poorly cut hairs also are contributory factors. Shaving in regions with dense, thick, or coarse hairs, such as the beard, scalp, chest, armpits, and for some, arms and legs increases the likelihood of developing ingrown hairs. Curly hair and hair that grows out of the skin angularly rather than straight also contribute. 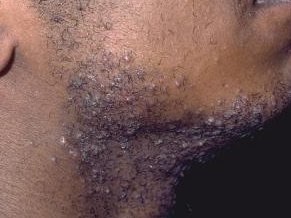 Pseudofolliculitis barbae (PFB) is the medical term for shaving-induced follliculitis specific to the beard region. Thus, men generally suffer from PFB. The neck is the most common site. Most cases involve tiny bumps that cluster together to look like mild, inflammatory acne – and it may be misdiagnosed as such. Some cases, however, become very severe and resemble cystic acne with pus-filled nodules. In dermatology practice, PFB often suggests the latter, the “angry” version of razor bumps. A PFB that escalates over the course of a few days should prompt a dermatology visit. The formation of significant pus, a boil(s), or unusual tenderness are signs suggestive of a secondary infection. In this situation, simple at-home measures may not help with resolution. A serious PFB condition may require treatment with a topical or oral antibiotic, incision and drainage of a boil, a benzoyl peroxide solution, or, sometimes, steroidal injections for keloid scarring. Razor bumps may range from pea-sized red pimples to tiny, white pustules to very tender, walnut-sized boils (abscesses). They may be asymptomatic, mildly itchy or tender, or very painful. Pus formation infrequently results from bacteria entering the skin through small tears. Sometimes the body can resolve a minor bacterial infection on its own. However, if the situation worsens – for instance, a swollen hard lump under the surface of the skin (a boil) develops or pus increases – you should seek medical attention. Depending on severity and the presence of secondary bacterial or fungal infection, resolution can take a few days up to several months. Naturally, the more inflamed the lesion(s), the itchier, or usually, the more painful. Occurs when a hair pierces the skin after it exits the hair follicle or opening. Most common in those with curly hair because once the hair is shaved, the sharp tip of that hair may reenter the skin. The body thinks this hair is a foreign object and bolsters an inflammatory response. Occurs when a hair pierces the skin before exiting the follicle. Secondary to use of multiple-blade razors or razor machines with a lift-and-cut technique. Other common causes include: dry skin, waxing, blockage of follicles by dead skin cells, oil or dirt accumulation, or friction against clothing. Again, the body tries to encapsulate the intruding hair with an inflammatory attack.